Dorothea Lange (1895-1965), Migrant Mother (1936), photograph, Graflex camera on 4 x 5 inch negative, Farm Security Administration, USA. Wikimedia Commons. This series has, quite accidentally, come to highlight the problems which came to dominate if not overwhelm narrative painting during the 1800s, and how they somehow seem to have become resolved by the late 1900s. The problems fell into two groups: what narratives should be used, and what techniques should be used to represent them. As I hope has been clear, during the 1800s and early 1900s, a wide range of narratives were used, including traditional myths, religion, and history, and more contemporary stories of all kinds. At the end of the period, problem pictures even invited viewers to engage in speculation and debate. Although classical Greek and Roman myths and religious stories continue to be used to this day, those based on moral and social issues of the time became more popular. Narratives have also been derived from a wider range of sources, including the theatre, and most recently movies. The issue of how to paint narratives was much harder to settle, and still remains controversial. This divides again into two problems: what rhetorical tropes to use (if any), and how realist the painting had to be. 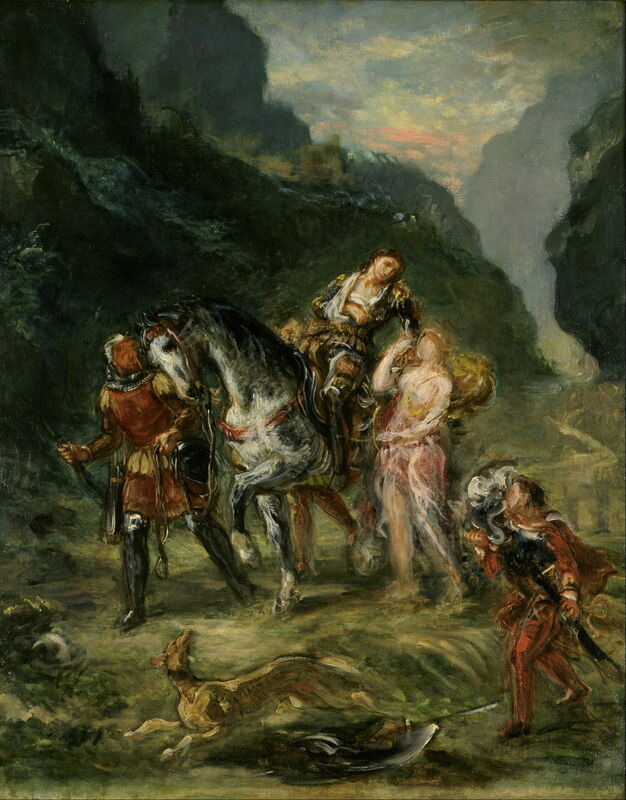 The use of symbols and their assembly into allegory had long been popular, but added another level of reading which was expected of the viewer. 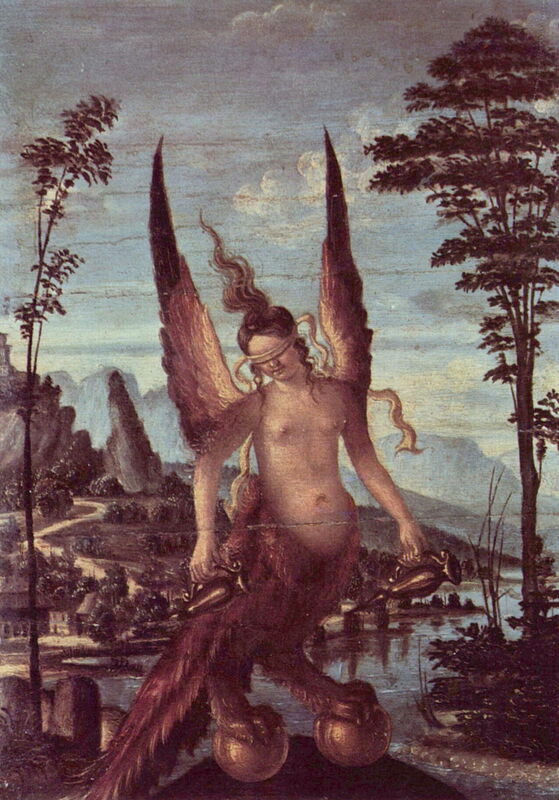 Giovanni Bellini (c 1430-1516), Allegory of Winged Fortune (1490), oil on panel, dimensions not known, Galleria dell’Accademica, Venice. Wikimedia Commons. abundant and long hair at the front of the head, and little at the back, symbolises Kairos, the moment of opportunity, which can be seized by the hair when approaching, but once passed cannot. Other viewers may miss some of those allusions, or interpret them completely differently. 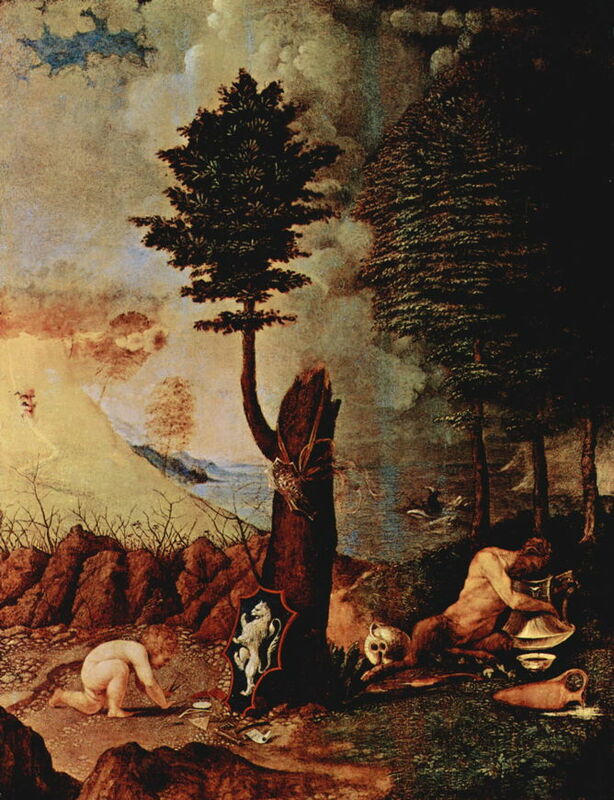 When you then try to express more complex topics or narrative in allegory, the end result can be bizarrely cryptic, as seen in Lotto’s Allegory of Prudence and Wisdom (1505) below. Lorenzo Lotto (c 1480-1556/7), Allegory of Prudence and Wisdom (1505), oil on panel, 56.5 x 43.2 cm, National Gallery of Art, Washington. WikiArt. 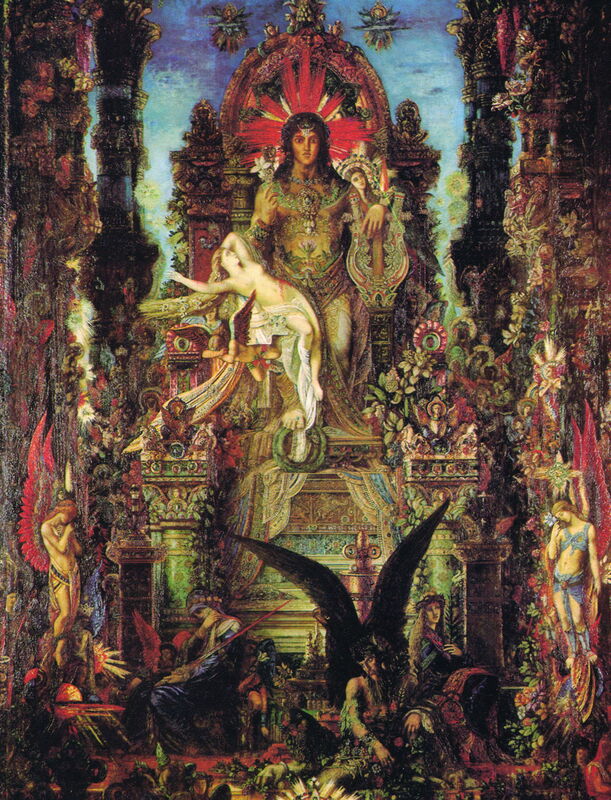 Despite the lessons which should have been learned about the use of allegory and symbols in narrative, a few artists persisted, and Moreau finally took it to phantasmagoric excess, in paintings such as his Jupiter and Semele (1895). I cannot help thinking that such canvases were never intended to be seen by the crowds that attended the more popular exhibitions of art in Salons, expositions, and public galleries. One solution to the problem of symbols in narrative paintings was that claimed by Picasso: that it was not up to the artist to determine how to interpret the symbols, but a matter for the viewer/reader. 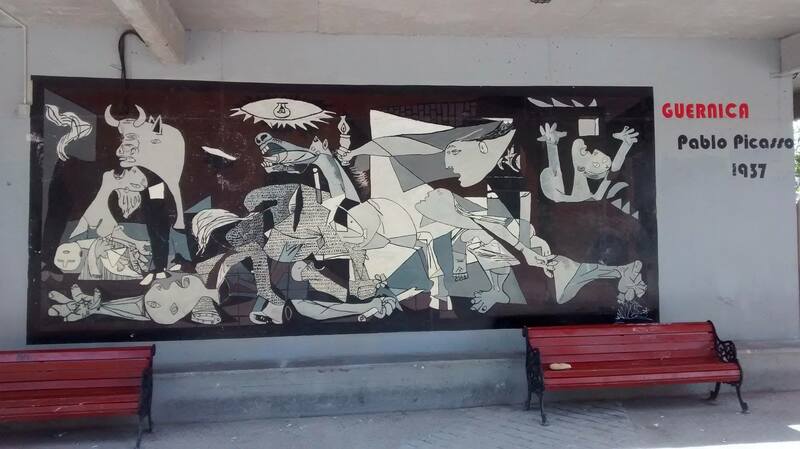 Anonymous (November 2014), Public urban mural painting in Covarrubias, Ñuñoa, Santiago de Chile, after Pablo Picasso (1881-1973), Guernica (1937), oil on canvas, 349 x 776 cm, Museo Reina Sofia, Madrid, Spain. By Ciberprofe, via Wikimedia Commons. In this particular case, the clear reference to the horrific destruction by bombing of the Spanish Basque town of Guernica channels readings in a limited range of directions. Where an external narrative is not directly referenced, or may even be obscure or absent, the range of readings opens up, and many viewers find it hard to discover any coherent narrative at all. 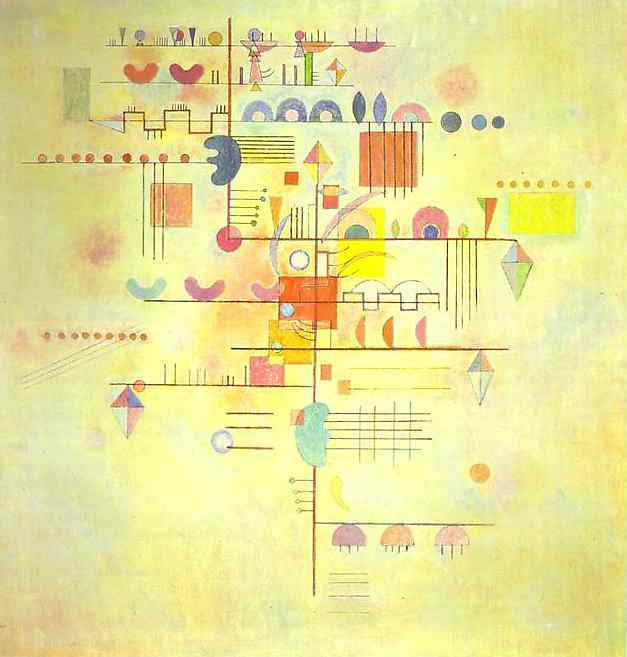 This is exemplified in much of the painting in the middle decades of the twentieth century, such as Kandinsky’s Gentle Accent (1934), below. Is it ‘just’ an abstract, or is it rich in symbols which are intended to convey narrative? Wassily Kandinsky (1866-1944), Gentle Accent (1934), oil on canvas, 80 x 80 cm, Solomon R Guggenheim Museum, New York. WikiArt. This problem of reading images came to a head, though, with photographs. During the twentieth century, these became far more accessible and popular than paintings, even (or perhaps more particularly) when they were in monochrome. Not only did it become very cheap, quick, and easy to take your own photographs, but photojournalism reached mass markets in weekly news magazines. At first, the public appeared content to be steered into reading photographs in the way that editors (and sometimes photographers) intended. 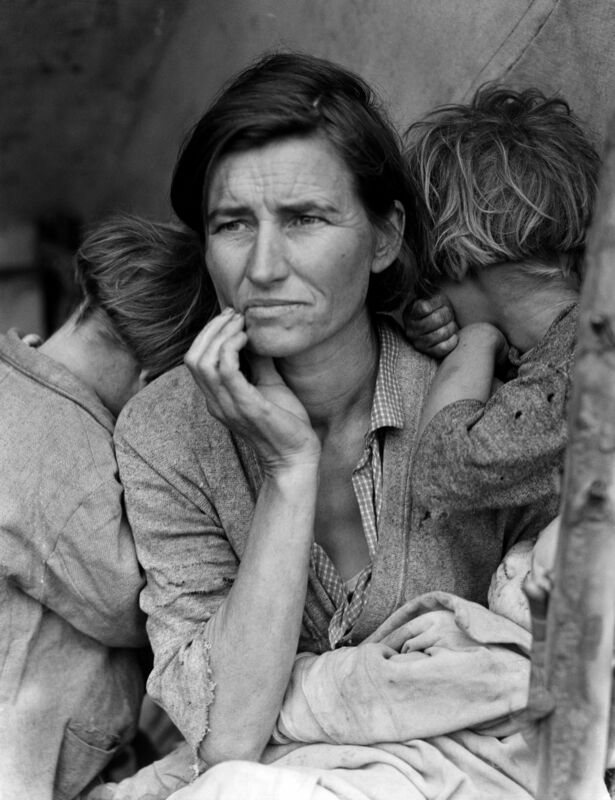 Images such as Dorothea Lange’s Migrant Mother (1936) were seen by tens of millions of people around the world. Destitute pea pickers in California. Mother of seven children. Age thirty-two. Nipomo, California. it is so convincing and conclusive that, as popularly held, ‘the camera cannot lie’. But even this image has become controversial, with other images from the same series implying rather different readings, and some scholars claiming that its subject, Florence Thompson, was not a farmworker at all, but a ‘Dust Bowl migrant’ with quite a different narrative. In the last few decades, the widespread availability of techniques for photomanipulation, particularly digitally using apps such as Adobe Photoshop, have if anything negated the old adage, and encouraged scepticism in readings. Many viewers now appear to consider the photoreal to be potentially as fictional as the painterly. 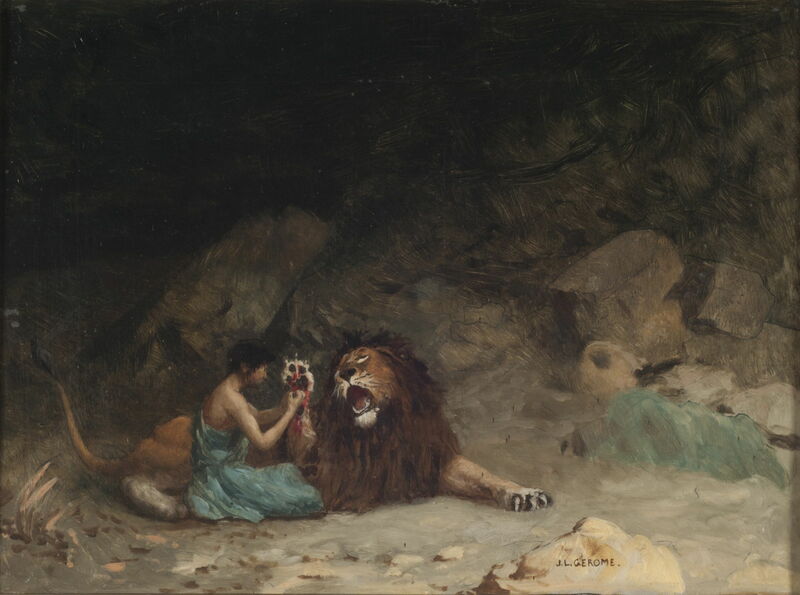 Where narrative paintings depend on subtleties such as facial expression, and relatively small cues which may be scattered over different passages, the simple solution to conveying narrative had been meticulously detailed realism, of the kind used by Gérôme. 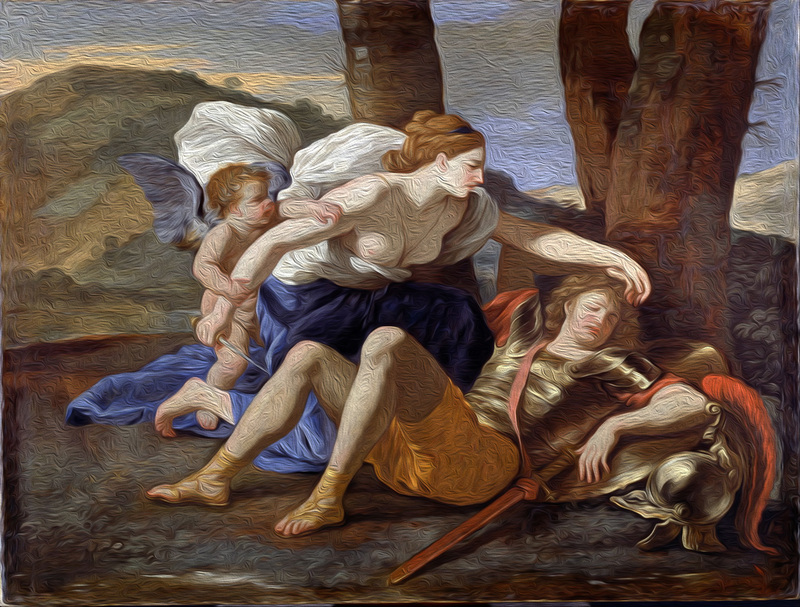 It is easy to demonstrate how quickly the necessary details can be lost by manipulating an image such as Poussin’s Rinaldo and Armida (c 1630) using Adobe Photoshop CS6 to produce appearances of ‘brushwork’. Nicolas Poussin (1594–1665), Rinaldo and Armida (c 1630), oil on canvas, 82.2 x 109.2 cm, Dulwich Picture Gallery. Wikimedia Commons. Digitally manipulated using Adobe Photoshop CS6 to produce appearance of ‘brushwork’, with deepest apologies to Poussin. 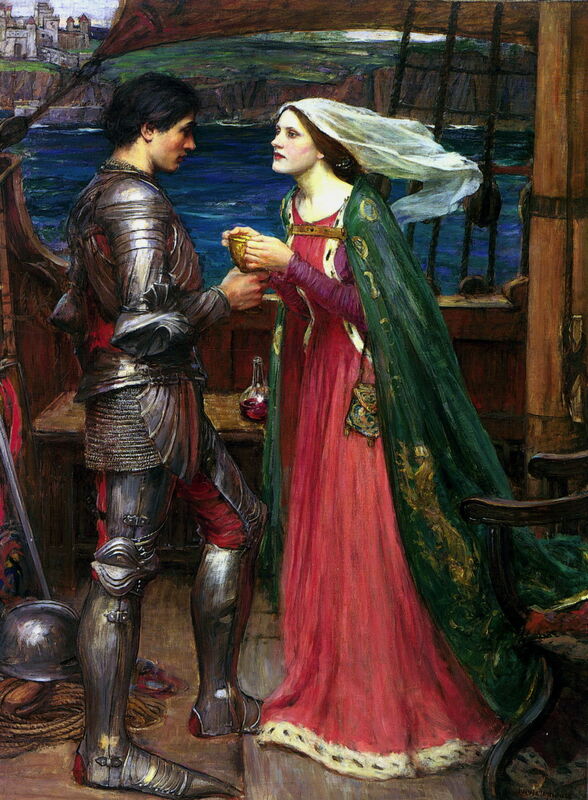 But with a skilled brush, Waterhouse and Gérôme himself in a small study showed that painterliness was not necessarily contraindicated in narrative. 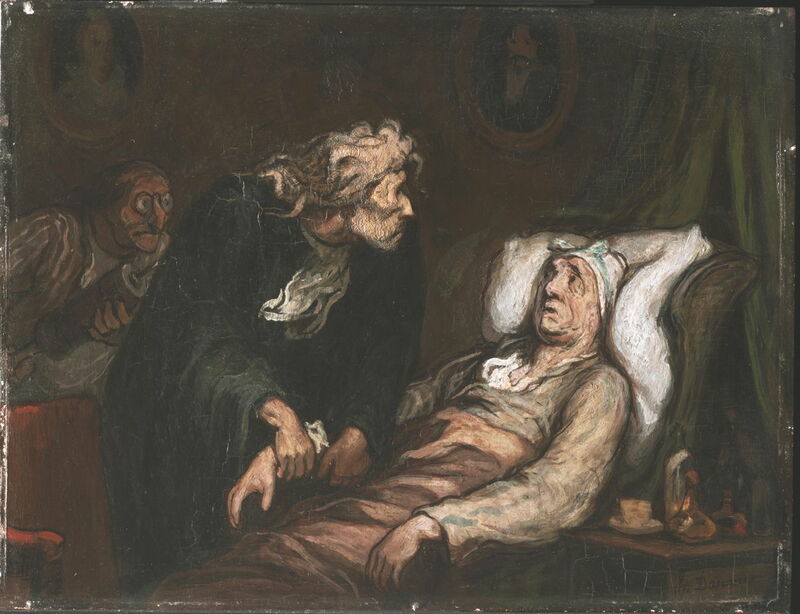 Others, including the pioneers Delacroix and Daumier, had also painted narratives eloquently despite their use of visible brushstrokes, even quite basic mark-making. But this did not work as a general rule. 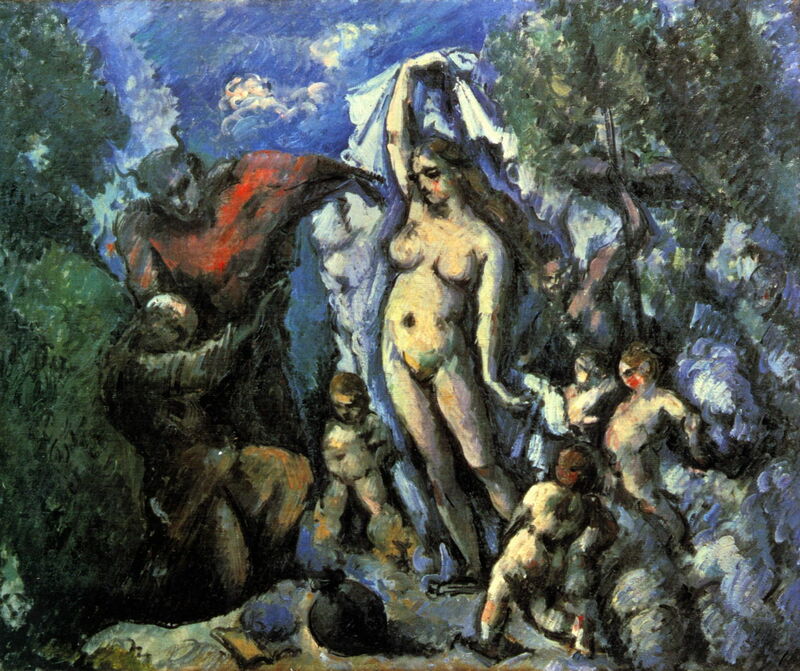 Where the narrative to which the painting referred was well-known and the cues relatively clear, it could hold good, as in Cézanne’s example. However, anything which relied on subtle details, such as the thumbs-down gesture in Gérôme’s splendid and authentically-detailed Pollice Verso (1872), would fail unless it employed a meticulously detailed realism. It is also worth noting that this was painted within just three years of the Cézanne above, which make fascinating comparison. 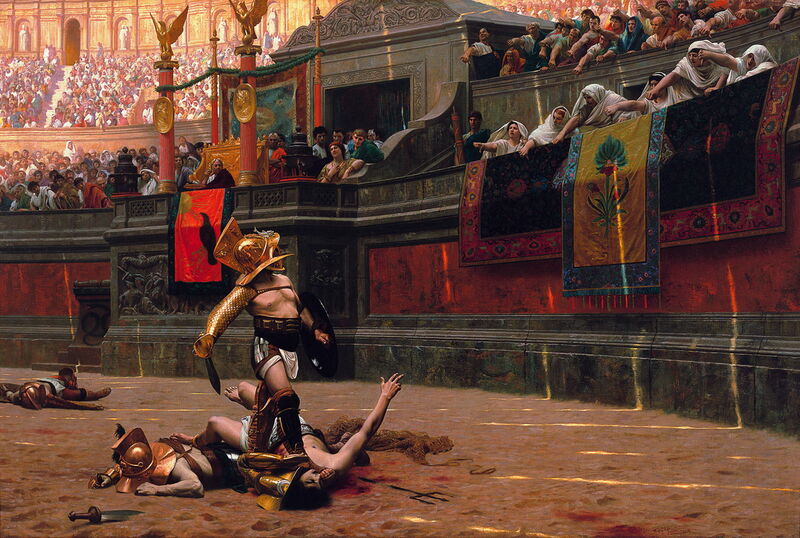 Jean-Léon Gérôme (1824–1904), Pollice Verso (1872), oil on canvas, 96.5 x 149.2 cm, Phoenix Art Museum, Phoenix, AZ. Wikimedia Commons. Once such ‘Salon’ paintings fell from favour, many narratives could simply not be expressed in paintings. As realism became more acceptable again in the middle of the twentieth century, so the way was open for the likes of Paul Delvaux, and ultimately the new generations represented by Paula Rego, Peter Doig, and Stuart Pearson Wright. Today’s more liberal attitudes to realist, painterly, and gestural styles now invite the artist to use whatever is best suited to the narrative, rather than being bound to what is deemed acceptable – just as novelists, playwrights, and other artists have been enjoying for a lot longer. I find it mystifying that, despite their classical training and unsurpassed technical skill, the more traditional masters John Singer Sargent, Joaquín Sorolla, and Anders Zorn, almost completely avoided making any narrative works. (There are some exceptions to this, such as Sargent’s murals, but they are remarkably few in number and atypical for their work.) Each paid the bills from their lucrative portraiture commissions, and preferred to obtain their pleasure from landscapes and genre scenes rather than anything remotely narrative. Perhaps that is more a reflection of the state of narrative painting at the turn of the century. Posted in General, Painting and tagged allegory, Bellini, Daumier, Gérôme, gesture, Kandinsky, Lange, Moreau, narrative, painting, Picasso, realism, symbol. Bookmark the permalink. I have fixed a bug in the HTML source which stopped some of these images from being shown at full size. They should now all work correctly. My apologies for the earlier limitations. Dyssomnia, or how did saving energy get so complex?